I was positioned on Middle Rd just off Colinroobie Rd where there are 3 possible dams in close proximity to the road where the black cockies could come in. I had seen one at one of the dams a few weeks back so was hopeful there was still water in at least one of the dams. Unfortunately after arriving early around 5.30pm I tried to see if I could get close enough to each dam to check if there was water present but each had locked gates However, I was pretty convinced there was water in one of the dams as there was a Little Pied Cormorant perched in a tree over it. So I felt that was the dam to keep watch on the most. Being so early, I was entertained with plenty of birds along that road, despite it being fairly sparse tree or bush-wise. There were a number of small wattles coming into flower on the bank beside the fence line and I walked slowly between the bushes to discover a wonderful selection of birds feeding or hiding there. Birds such as thornbills and to my surprise a Rufous Songlark and a pair of Red-capped Robins. 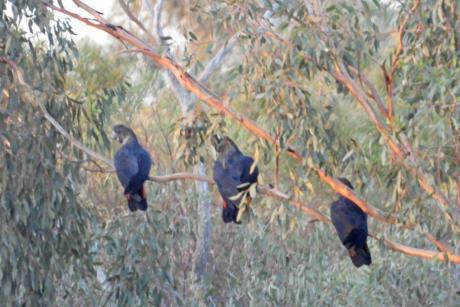 I was being continually distracted by Little Ravens flying about which looked like Black Cockies when perched in trees so I was quite surprised around 5 to 7 when what I assumed to be ravens in a gum tree over the lower dam on the right hand side of the road turned out to be a pair of glossies! Wonderful! They flew out over the top of me and headed towards the cormorant dam but by the time I got level with that dam, I couldn't relocate them. And no more showed the rest of the time I waited – pity! 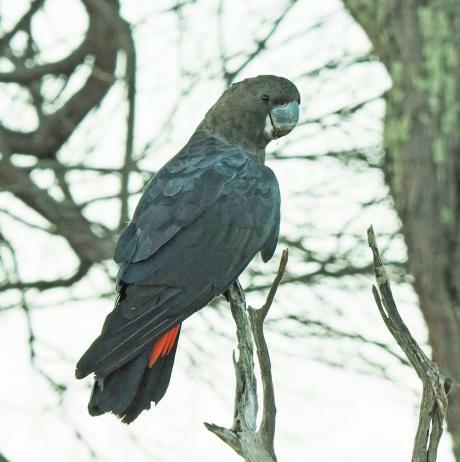 While sitting by a dam on Back Hillston Road recently when taking part in the Glossy Black Cockatoo count, some old childhood memories started flooding back. I grew up on a farm 40km’s north of Ballarat and I remember going and collecting bird eggs with my stepfather each Spring, we had a very good collection of bird eggs that I must see if I can borrow next time I go back to the farm. I remember collecting the odd magpie egg way up in the cypress trees with shouts of warning coming from below when the magpies were on their way to swoop me and every time I smell the cypress it reminds me of those times as a child. Although I didn’t see any Glossy Black Cockatoos that evening I did get to see quite a bit of wildlife and it was a lovely evening for bird watching. Firstly as I tried to sneak up to the dam and look for a good spot to position myself for the next two hours, at least 50 Pacific Black Ducks took off making me realise I need to brush-up on my sneaking skills. Once settled into my position it wasn’t very long before the wildlife started returning to the water and two large goannas started patrolling the water’s edge and then disappeared over the other side of the bank. Currawongs and Willy Wagtails kept me company for most of the evening and a Wedge tailed eagle soared off in the distance. A small group of Rainbow Bee-eaters flew in just before dusk and unfortunately I could not get any good photos of them due to poor light. I was also amazed at the number of kangaroos surrounding me most of the evening and I could tell they were looking forward to me leaving so they could get in and have a drink from the dam.